As readers are painfully aware, the Weston / Mount Dennis area is plagued by a large number of payday loan companies. These pseudo banks prey on the poor by charging high rates thus continuing the cycle of poverty that poor people (and those with a low credit rating) often find themselves in. Scotiabank’s recent departure from Lawrence and Weston didn’t help and it seems that computerization will encourage more banks to close their branches. Alberta is going through some tough times lately and to help stem the exploitation of people with a poor credit rating, the NDP government there has cut the interest rates that PLCs can charge. Alberta will now have the lowest rate in the country at $15 for every $100 borrowed over a period of two weeks. In Ontario the rate is $21 per $100 which compounded annually is a startling 14,299%. There has been talk of lowering the rate but a bill to amend the laws around PLCs has been languishing in a committee that was supposed to report this spring. Payday loan companies have a fairly well-connected lobby group fronted by Tony Irwin of the Canadian Payday Loan Association. 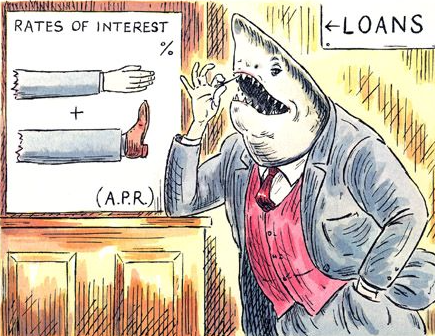 Irwin maintains that if rates go down, some PLCs will close thus driving lenders to loan sharks. From what I can gather, in the days before PLCs put loan sharks out of business, loan sharks charged around 6% to 10% a week. Slightly less than today’s PLCs. Collection tactics were a bit more assertive however. So, Ontario – the ball is in your court. Where is the committee report and legislation that will curb predatory lenders? Where are the banks and credit unions in all of this and why are they not making better efforts to reach the poor? The gouging of the poor and gullible, those without computer banking, and those unable to get a bank loan by the payday cash companies is an important social problem. We see it all over Weston, and legislation is needed, and education to counter the promises plastered all over these companies that mask the reality of their interest structures. Previous Previous post: Farmers Market – my 2 cents.